Kueblinger Ring - An der Plantage - An der Bleiche - cross Helmstedter Str. - Uferstr. - left: Am Muehlenbach - Waldmuehle - before the Forsthaus Burgtal turn uphill on your left - cross plateau with the old crippled beech trees, go straight to the end of the woods - shelter hutch - Eitzum - foot- and biking path back to Kueblingen. In the center of St. Stephanus Churchtower - the ancient convention room of the first settlers - there is a 3 m high column made from Elm-chalk stone. The column is decorated with reliefs of Wotan and animals reminding of ancient gods. It may date back to the begin of Christianity. ... whether an old bulwark was lateron converted to a chapel is unknown. Decorations may actually date back to the time when Schoeppenstedt was first mentioned (1051). 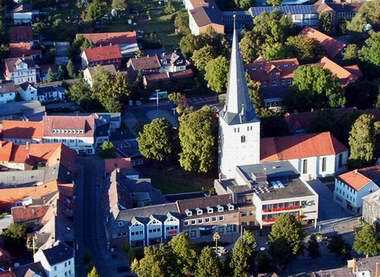 Within the Elm-area, the church of Kueblingen is an exemption. It is a peculiar angular-shaped gothic building, actually the merger from a church and a pilgrimage chapel. The shrine is found at the angle below the pulpit. Since male and female persons were accomodated in one or the other wing, respectively, both groups were able to see the preacher but not each other . Dating back to 1300, there is a Latin report about the origin of pilgrimage in this region which tells about a miracle-working statue of holy Mary, acquired by two farmers of Kueblingen on Peter-and-Paul 1291 in Koenigslutter from merchants that had arrived from the Rhein area. Parish priest Wegscheider reports 1777 about the existence of a wooden statue, which, according to the legend, had one warm and one cold hand (a likely consequence of repair work using a different material). Still now there is a statue found in a niche at the outside wall reminding of these old days. The stone in front of it is believed to be the remnant of an old decorating tower. Daß dem Kloster Marienberg Gerechtsame davon zugestanden, davon wird nichts erwähnt, doch die Domina und der Convent des Klosters ertheilten 1618 ihren Consens in die Erwerbung weil unter dem Lande 6 Hufen und ein “Holzfluck, Lah genannt, begriffen wären, welche von ihm zu Erdenzins rührten”. 1630 stellte die Priorin... einen “Meierbrief” dahin aus, dass sie dem Capitain=Lieutnant Christoph v. d. Streithorst, Erbgesessen auf Küblingen ihren freien eigenthümlichen Hof mit 4 großen Hufen Landes... Das Gut ward in die Rittermatrikel aufgenommen. 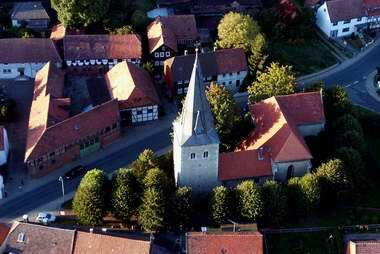 Zu dem Besitztum des Klosters kam 1330 noch die Kapelle und die Kirche in Küblingen, welche in diesem Jahre Herzog Otto demselben verehrte.